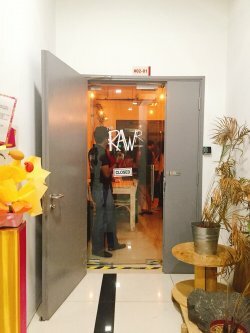 The RawR Kitchen is somewhere I would have never imagine that I would have visited since its located in the Industrial area of Bukit Batok and in an obscure part of the building in The Splendour. 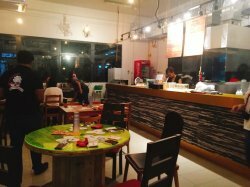 However, once you have found this place, you will be glad that you have discovered it as it is a good place to meet or even chill up after a hard day's of work. Furnishing are simple and I am amazed by the restricted area that contained huge tanks of beer. The area fenced up and only authorized personnel are able to access with the use of biometric security system. I like the part where they did their local craft beer and with funny beer signages around. 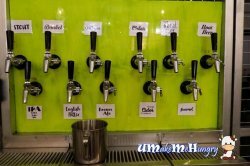 This portion of the cafe was rather interesting as it has different kinds of taps stating kinds of beer available in The RawR Kitchen. It's not your usual kind of Bolognese with tomato sauce all over. The way they prepared was authentic and delicious! 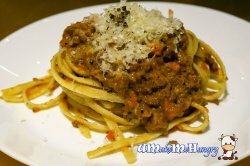 I was impressed by the way how minced meat was generously spread in the Al Dente pasta and topped with shredded cheese. And a little background from the kitchen: the meat was stewed for 5 hours and if you step into a cafe in Italy, this will be the exact same taste. While enjoying our dishes whipped up from the kitchen, some of the dish is good for pairing up with certain type of beer. 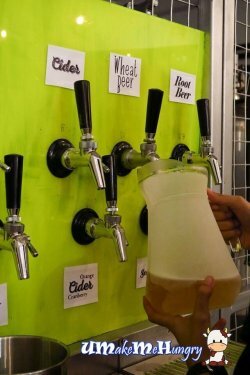 I was totally stunned when I saw them filling up the chilled mug with beer from the taps. Aren't those tap for show only? Perhaps we should put our mouth there instead. We had a first try on the Wheat Beer, it was light tasting. Our second try is the root beer, yes this is not your usual kind of A&W root beer, it is sweet with about 3% of alcohol content and tasted with hints of the softdrink. Well, this is the preferred drink by the lady. Our 3rd drink will be apple cider that has a mixture of red and green apple. Taste is mixed too, a little bit of sour and sweetness with alcohol content at about 3.5%. Ah! My comment as someone who did not touch beer so frequently. Brown Ale did taste like a cup of Hojicha to me! 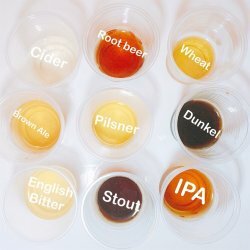 Bitter and containing 6-7% alcohol. Pilsner, to me is "sugarless tea", kind of reminds me of "Pokka Ayataka" and somehow similar to the Wheat Beer. Dunkel is rather common to me and its closer to stout and of course heavier than Pilsner. 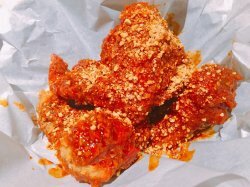 This is best to go with the molten wings if you are ordering some. IPA which also known as the India Pale Ale is intense and spicy. It kinds of clear cut, either you like it or you hate it. Stout containing about 8.8% is known for its "coffee flavour". Not taking alcohol, you can choose to have some plain water. 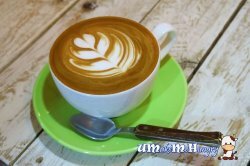 However, if you prefer hot beverage, do not worry, as you still can enjoy a cup of cappuccino with latte art . 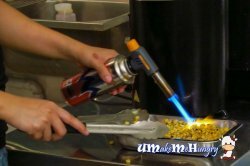 While everyone was busying socializing, we had a look over into the kitchen and saw the butter corn kernels went through the raving flames. Guess what dish are they preparing for? The New Zealand Air-flown Sirloin steak was delicious! 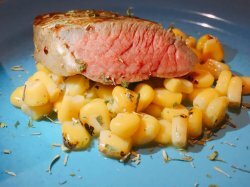 Rubbing with just simple salt and black pepper, it goes good in its grilled medium rare form. 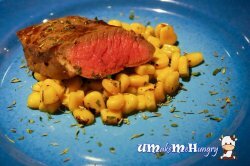 Dish is served with flamed corn kernels and sprinkled with herbs. However, the picture shown is not a complete version of the Striploin Steak at $16 as the actual one will be served with Flame Grilled corn cob, mash and mixed veggies. 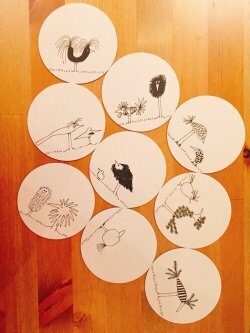 While the stomachs were still groaning after the dishes, we turned our heads around to check out the next dish in the kitchem... Guess what is this lady doing? While Salted Egg dishes are in the trend, its hard to leave such dish out in the menu. 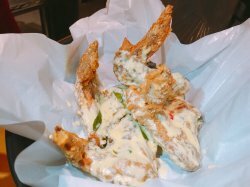 The hand-made creamy salted egg sauce brought a little bit spice to the wings. Wondering what's the helper up to at the kitchen island? She preparing us for a challenge! I gave up eating this after licking its sauce on my fingers! Can you imagine how spicy it is? WARNING! This dish is definitely not for the weak - like me. Tears immediately welled up a few seconds after I tasted the sauce. It was a terrible experience and in fact most of us could not take that level of spiciness. Luckily we took some sugar as a remedy to let the spice subside. Deep fried and originally dressed withing any sauce. 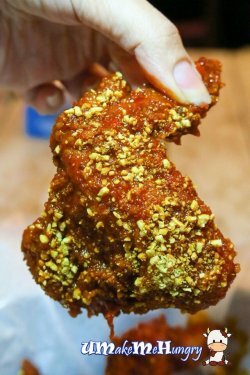 Comparing to the 2 others wings, I preferred this special recipe of such golden fried wings. Beware of burning tongues. These are really good stuff! 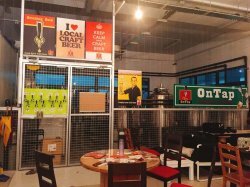 If you want to quiet down after a day's of work and enjoy some local craft beer, look no more, visit The RawR Kitchen and you will be surprised by the amount of F&B outlets had increased among the industrial estates over the years. In the ula ula industrial park area, one was surprised to find a bistro hidden in second floor of a unassuming building. Following the instructions on the facebook, I had a hard getting myself out of the carpark of the WECGA Tower, after dropping off at the bus-stop in front of the building. 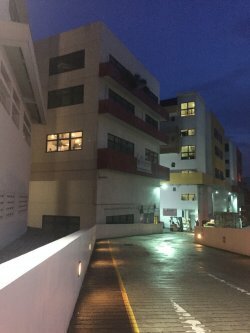 It turned out that the vehicles enter the carpark of WECGA Tower through the second floor, so had to find the exit of the carpark. 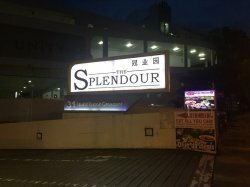 I was so happy to see the signage of THE SPLENDOUR right in front of me after getting out of the carpark. After that it was easy to find the Japanese buffet restaurant and take the lift up. The restaurant was decorated in a industrial look, with mis-match furniture around. The bistro also housed a microbrewery. 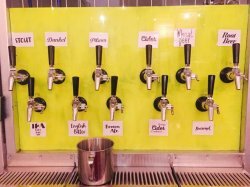 The place was a bistro by day and a drinking hole by night, offering a range of craft beers. 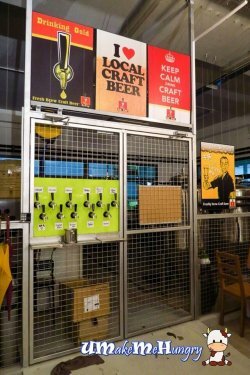 The place was awarded Silver for the 2016 Southeast Asia Beer Awards. The place also offered free wifi. 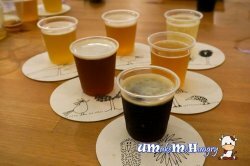 If you are a great drinker, don't forget to take the Beer Buffet which cost $35nett for 2 hours, which was available during weekends (Friday, Saturday and Sunday). 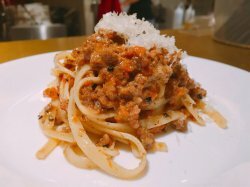 Painstakingly stewed for 5 hours, the restaurant make the meat sauce the right way for the right taste. Exactly how it would taste stepping into a cafe in Italy. Unlike the usual red sauce with lots of tomato, the version here was served with a rich thick minced meat sauce with barely any sauce. It was very flavourful dish. Air-flown New Zealand Chilled Sirloin, just simple rock salt and black pepper, pure grilled bliss. Served with Flame Grilled Corn Cob, Mash and Mixed Vegetables. The sirloin was tender and juicy, and cut through easily. The corn was juicy and buttery in taste, which I can't help wishing for more. Home-made creamy salted egg sauce. 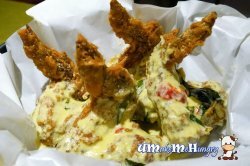 The deep fried chicken wings were tossed with the creamy sauce which tasted more curry powder taste, similar to the zhi char type than the coarse salted egg which I preferred. Please be warned. NOT FOR THE WEAK. You don't bite into these wings. THEY bite into you. The bistro had to state such disclaimers, just so that they can, you know, get away with murder. It smelt like Rojak but burnt like hell. The sauce had a unusual numbing effect on the tongue. One needed English Bitter beer to cool down the effect. As for me,no matter how many glasses of water it had no use. In the end, I had to down a packet of sugar. My favourite beer turned out to be Root Beer which tasted actually like the soft drink with a sweet and fruity taste, but ended with an alcoholic feel.